There is nothing like a Texas thunderstorm. The hot wind knocking at oak trees and beating rain on rooftops are powerful reminders of the force of nature. Thunderstorms can cause a great deal of destruction; knocking down trees, damaging road ways, flooding homes, and even in extreme cases taking human lives. However, the flip side of a storm is that it quenches a dry and thirsty earth, supplying the landscape with new life and refreshing water. The overall message of the storm is a simple one; power can be destructive and/or it can be rejuvenating. Much like a thunderstorm, we each have the ability to do both great harm and great good in this world with our thoughts and actions. I think that we all need to be taught (or reminded) just how magnificent we are. We need to be told from the very beginning and everyday there after that we are indeed powerful. Often we get the opposite message, we are told we are not enough, that we are at the whim of circumstance and fate. But this is a lie, no matter how the world has tried to disempower us, each of us is a remarkable being capable of moving mountains. You are powerful. I am powerful. We are powerful. The way we think, move, and relate has an impact on the world around us. Take a second…notice your own power. Just bring your awareness to it. Where is it in your body? In your thoughts? How does it manifest? Get to know it…please. Because most importantly, we are not actually thunderstorms. We are conscious beings and we have choice in how we put our power to use. We can use the agency and magnificence we have how ever we like. What will you choose? How will you take action in the world, in your own life, in your body. What ever you choose, please do it consciously from a place of truly knowing who you are and what you are capable of, because if you come at life “disempowered” you are destined to wreak havoc. When we become aware of, embrace, and respect our personal power then we can (each of us) water the earth with our powerful love. Start by picking the right time to do this ceremony. perhaps during a thunderstorm? Make sure you dress in something that makes you feel very much like “you”. Pick a space where you already feel safe and empowered. This could be in your home or workplace, just make sure you won’t be interrupted for a few minutes. Gather: a candle, a lighter or matches, a piece of jewelry or a stone that you like and can wear or carry with you as needed, something sweet to eat and some favorite music of yours…perhaps a power ballad? dim the lights and light a candle. Allow your self to sit in front of the flame of the candle and look into it. Contemplate. Ask yourself these questions one at a time and sit quietly until you get a reply to before you move on to the next. Feel free to read the list as you go or even to briefly write the answers that come to you down in a journal. How am I like this light? What parts of me get lit up easily? How do I feel and think when i am lit up? How do I act when I am lit up? What holds me back from feeling lit up or empowered all the time? How can I lovingly move those limits out of the way for now? What does it feel like to be limitless? What would change if I could limitless all the time? Feel the power of your own body, your thoughts, and your emotions as they are right now. Know that what ever you feel is enough and it is real. Feel gratitude as you put the jewelry item on or place the stone in a safe pocket to be carried with you as needed. watch the smoke until it dissipates. Afterwards and as you clean up eat something sweet or listen to some empowering music. Maybe a dance party? 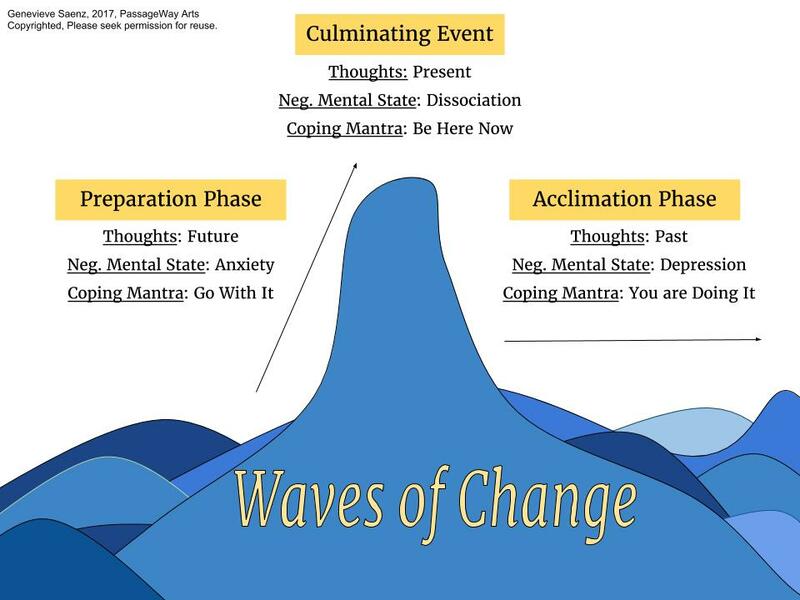 All life transitions happen in three stages. Preparation- A time of great planning and anxiety where the looming change is approaching and we are separating from our past perceptions of who we are. Culminating Event- The moment of "In between" when we are neither here nor there. The experience during these times is very "here and now" oriented. We may feel overwhelmed like we can't find solid footing. Acclimation- This is the "calm after the storm" where we slowly piece our selves back together. Grief can loom over this stage and thoughts of the past. However, it is also here that we settle into the new patterns of a new life. 1. Expressive- The focus of Expressive Arts Therapy (and perhaps all therapy) is to facilitate client expression with the goal of clarity and meaning making. Sometimes having a caring conversation is all a client needs to gain insight. However, it is really just one mode of communication in a sea of possibilities. Writing, moving, singing, stretching, laughing, crying, breathing, painting, pointing...they can all be expressions of truth. As an EXA therapist I am interested in multiple perspectives and ways of being in the world. In the expressive arts the value is always placed on the expression and the process, rather than the product. 2. Arts- There are so many ways to be an artist; a gardener is an artist at work in the medium of dirt and water and possibility. There is a reason we say "arts", with and "s". In Expressive Arts therapy there is an emphasis on all creativity and creative acts as a healing tool. Sometimes this means we pull out the paint in session, sometimes it means we play in sand or tell stories or explore song lyrics. The magic of the expressive arts is in the transition between mediums; multiple art forms can meld in to a unique creative experience. It might sound intimidating, but every arts intervention offered is simply a suggestion; an invitation to step in to your own creativity and see what treasures you can uncover there. It turns out the summer is slow in the private practice therapy world. Clients take vacations and (maybe more importantly) that which was a crisis in the dark days of winter somehow melts into "manageable" as the days get longer and the air gets thicker. There is just somehow less need. So, my schedule has opened up and so has my worry. I am only a few months into this new venture and I still get pretty nervous when a week goes by with no new clients calling me. So, I do what any budding professional would do...I call them. Kind of. I have started to solicit group work from local agencies. These groups are contract work where I a hired to come in as an art therapist and lead several sessions of Expressive Arts interventions. Even though all this started just to drum up more work, I have to say it brings me such joy. I love therapy groups. I think they are rich with deep learning if you let them be. Each group is like its own little life form made up of individuals gathering for a common cause. The group has a life cycle, a purpose, and a product. The way a group forms, grows and establishes norms seems magical, but it is actually delicate science. Like all life forms, its main goal is survival. A group's members are always unconsciously doing a delicate dance to maintain health and ease within the group. They are balancing power dynamics, tasks, and established patterns. If a member doesn't have enough "buy in" if they threaten the group as a whole, the group will find a way to either enlist or expel them just as our bodies do with bacteria. All parts of the whole are working for the good of the whole and they are working because being a part of the group is nourishing to the individual. What an amazing reminder of the systems that we are, that we are a part of, and that we rebel against. The universe is just gatherings joining together to make organisms, joining together to make bodies, joining together to make groups, joining together to make organizations, joining together to make collectives, joining together to make planets, joining together to make systems. It is an infinite web of connection, of individual and other. And the most amazing part is; when you pull on any one part of it everything moves. That is why therapy groups can be so powerful and can acelerate the healing process so much. They offer an opportunity to witness and play a part in the growth of others and every time one person shifts, they all do. I have decided to persue my LMFT license and to open a private therapy practice. This will be a long and expensive process, but I think it will ultimatly bring me more of the work I love. It is a big transition for me and I am still in the planning stage. But it makes me wonder, what draws us to these transitions. I think we move towards a new phase of life when the old stuff is just not working for us any more. Is it always pain that pushes us out to newness? If so, what funny creatures we are...stubborn and yet so hopeful. I will keep the website updated with test results, suppervission decissions, and new office details. In the meantime, let me know...what motivates you to grow? to take risks? to blossom?